Featured albums of the week for KXCI Community Radio Global Express (7:20am on Your Morning Brew) Fishtank Ensemble :: Women In Sin Women in Sin brings this California group - leaders in high energy, cross-pollinated gypsy music - and their brand of Romanian gypsy jazz, Flamenco, Balkan, Turkish tango music to the world. Sia :: We Are Born Australian born Sia, sung the cool smoothies on her first release. We Are Born features her doing disco funk combined with throwback soul of U.K. crooners like Adele. The key is Strokes guitarist Nick Valensi, who's loopy and addictive riffs keep things bouncing right along. Local Pick of the Week (3:30pm on The Home Stretch) Holy Rolling Empire :: Noise Will Be Noise Tucson's high-energy, psychedelic indie-pop quintet rolls out their first of three planned vinyl EP's, followed by short supporting tours, on June 15th. 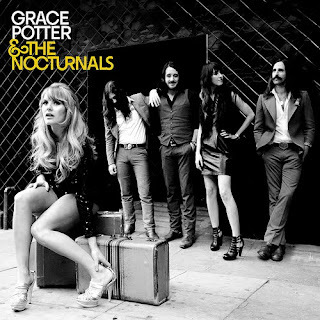 National Pick of the Week (5pm on The Home Stretch) Grace Potter and the Nocturnals :: Grace Potter and the Nocturnals If Burlington, Vermont native Grace Potter and her band the Nocturnals' 2008 album This is Somewhere sounded right out of the 70's, Grace Potter and the Nocturnals, their latest self-titled CD, steps back in time even further... You can also see her Tuesday, June 15th on Good Morning America (check local listings).